The current price spike hasn't gotten energy prices as high as they were in mid-2008, but they're already higher than any other time, and they're still going up. This trend will continue. I don't mean that prices will keep going up right now (although they may). 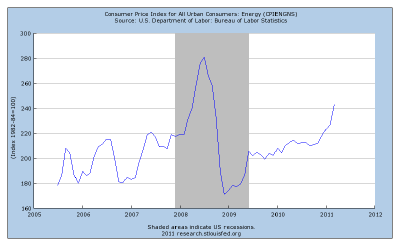 What I mean is that energy prices will continue to rise and fall. If your current living arrangements are such that sharp spikes in energy prices put your household finances at risk, you need to change your living arrangements. I've written about this before, starting with Plan for Expensive Fuel, written in 2007 just two weeks after I started writing for Wise Bread, and then again during the mid-2008 price spike in What If Energy Costs Keep Rising. Whenever prices went down, I'd write to suggest that you take advantage of the lower prices to Fix Energy in Tangible Form. My point is, the current price spike is not a surprise. Nor should it be a surprise when oil prices fall again in the future. Volatile prices are exactly what we can expect. We see this behavior of spikes and drops because of the nature of energy industries and the energy markets. First, demand for energy is elastic, but only in the medium term. In the short term — over the next few months — people will pay whatever it costs to get the fuel they need to keep their pipes from freezing, to keep their ice boxes from thawing, and to keep getting to work every day. Over periods of a year or two, however, people can and do make the necessary structural changes to adapt to high prices. They'll buy more fuel efficient cars. They'll buy energy star appliances. They'll insulate their houses. Once they make those changes, they tend to stick with them. If fuel prices drop after you've moved close to the office, you might ease up on your plan to walk to work every day, but you're not going to start driving out to where you used to live just because fuel is cheap. Nobody rips out their insulation or digs their old furnace out of the dump just because energy prices fall. Second, supply is inelastic in the medium term. You're only going to drill an oil well if market conditions make you think you'll make a good profit. But once you've got a well pumping, even if profits disappoint you're going to go on producing. When prices are high for a sustained period, consumers make permanent changes in their use of fuel. At the same time, producers make long-term investments in production capacity — capacity that will be used, even if prices fall. Finally, much of the energy market isn't a market. Oil-producing countries often supply fuel to their citizens at below-market prices. They also make non-market deals with oil-importing countries for political rather than financial considerations. That means that market pressures can have very odd effects. In a pure market economy, there really isn't any such thing as a shortage, there's just a market-clearing price. But in non-markets like the oil market, you can have gasoline selling for $1 in Venezuela at the same time that service stations in the US offering $5 a gallon can't get their tanks filled. Throw in subsidies and regulation, and the result is a market that falls well short of being a textbook free market. These factors, taken together, mean that we simply have to expect large swings in the price of fuel. I've always thought that the winning strategy was clear: Arrange your life so that you can get by on much less fuel than the average person — then take advantage of periods of cheap fuel to make permanent investments in your well-being. There are a thousand things you can do to make yourself less dependent on fuel. Some cost a lot of money (buying a fuel-efficient car, installing a wind or solar power system). Some cost just a little money (installing weather stripping). Some save you money (turning down your heat in the winter, leaving your air conditioning off in the summer). With many, the issue isn't that the accommodations are particularly expensive, but that they require a long lead time. A particularly important example of that last one: Move or change jobs (or both) such that you can get to work without needing to drive. It might take a year for your lease to expire, it make take several years for property prices to recover so that you could sell your house, or it might take going back to college to get a degree that would let you find a better job. But arranging your life so that you can earn a living even when fuel prices are high is very important. As far as taking advantage when prices are low, the field is pretty much wide open there as well. I've taken a couple of trips to Europe when oil prices were low and plane tickets were cheap. I bought a pressure cooker. If I owned land, I'd have dug a pond for fish and gotten all my ditches and berms the way I wanted them. The main point is simply this: Energy prices will rise and fall. Get used to it. Arrange your life so that you can take advantage of the lows instead of suffering during the highs. I think energy prices will always go up, It provides huge tax income. It is possible to save energy by renewables but I dont think governments are keen to promote that too much as they worry about the tax income they will loose. I think you're right that the long-term trend is up, simply because of physical resource constraints. But I think that's only half the story. Prices will also sometimes go down, because there's a lot of low-hanging fruit in terms of energy conservation possibilities. Of course, once prices go down, they'll go back up again. You need to be ready for both. I tend not to blame speculation for the swings in oil prices. As I explain above, I think most of the price action can be blamed on actual fundamental moves in supply and demand. When you think about it, speculation ought to be stabilizing—the smart speculators are going to be buying low and selling high. That ought to support prices when they're low and limit increases when prices are high. Of course there are plenty of stupid speculators who try to buy in after prices are already high, adding to the price spikes, but they tend to get wiped out when the bubble bursts. That limits their ability to make the same mistake again.